If you want to learn how to sew a pencil skirt with zipper start with basic skirt pattern drafting. 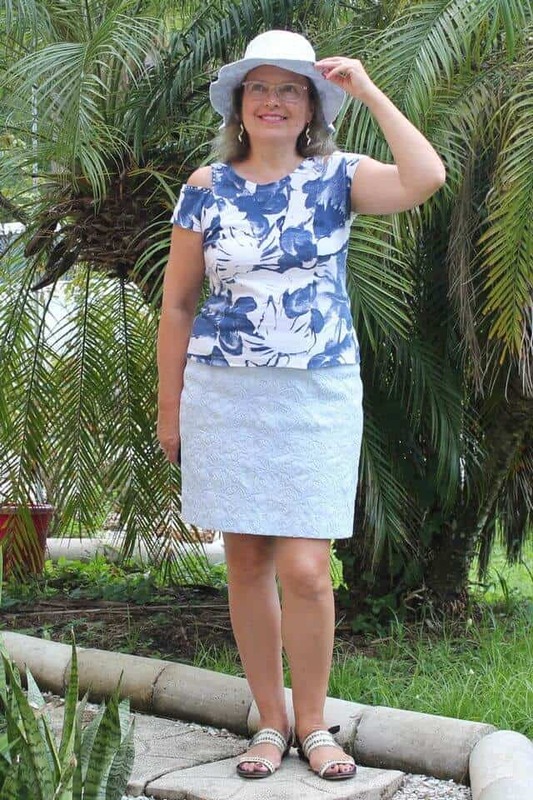 In this tutorial I am going to show you how to make a pencil skirt pattern, what is a good fit for a pencil skirt, what fitting problems you may have with a DIY pencil skirt and why you may have them, how to take proper measurements for a pencil skirt and how to draft a pencil skirt pattern from scratch (for a real woman – not a model). I prefer to sew skirts myself, especially since skirts are the easiest pieces to make for any shape! You can choose a skirt design that flatters your shape and makes it easier to achieve a comfortable and flattering fit. All you need is basic sewing skills, an understanding of fabric characteristics, and the right pattern. 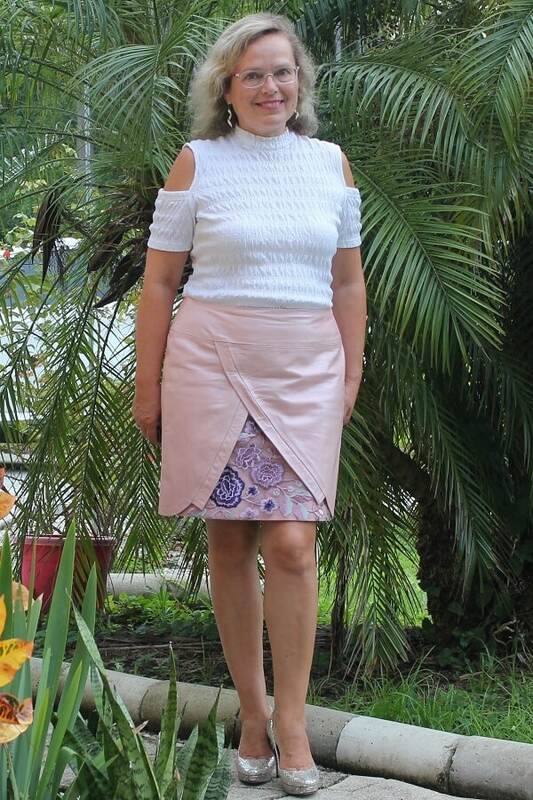 If you like sewing clothes, it’s really important to have a good pencil skirt sloper – custom-fitted, basic pattern which you can redesign and create many different styles of skirts, also you can use it to sew dresses. 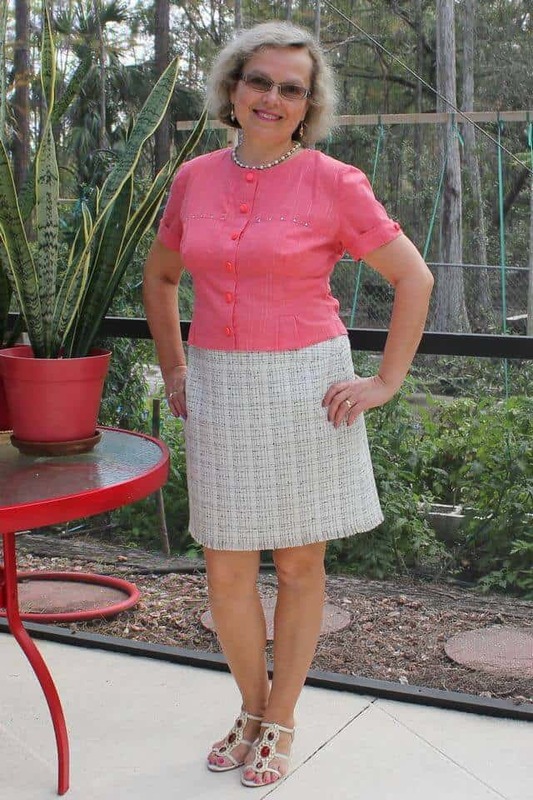 There are a few ways to get this pencil skirt sloper for your own measurements. 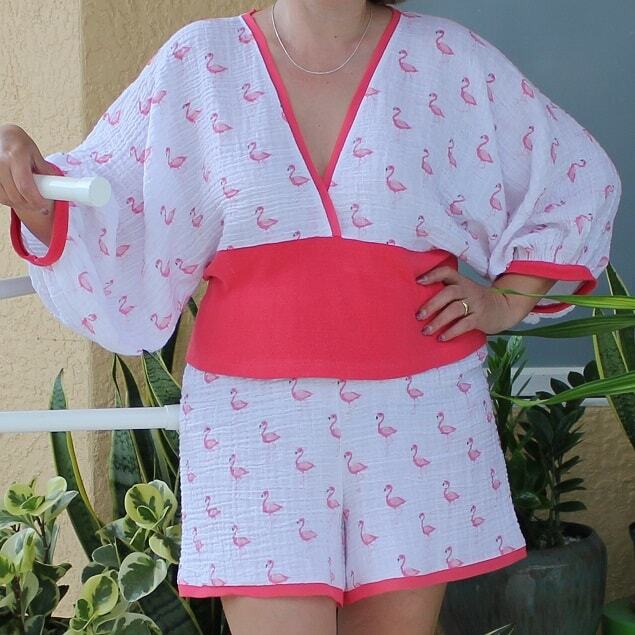 You can buy it (really cheap) from this company: Lecala sewing patterns. Here is the link. You put your own measurements and you get your sloper in PDF. You can draft your own sloper on paper. This is relatively easy to do and there are some tutorials on how to do it. 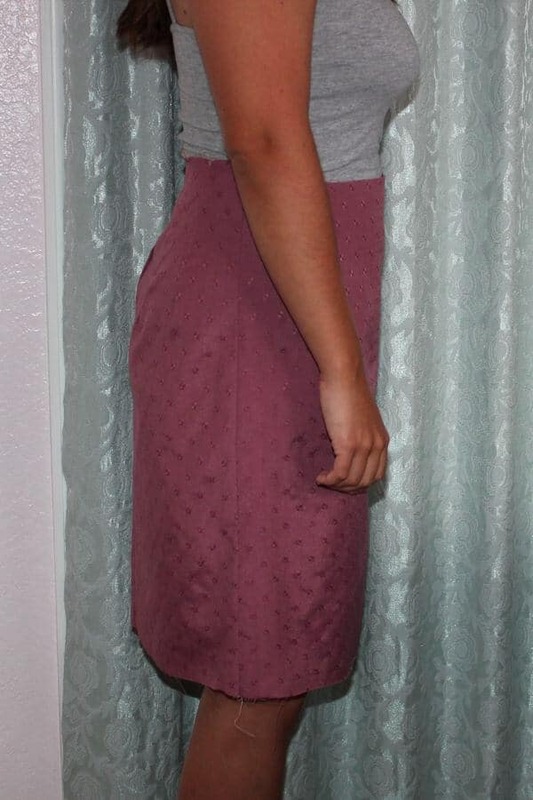 You can use a draping method in creating your own pencil skirt pattern. In this tutorial, I will describe the third way in detail. What is a good-fitting pencil skirt? Pencil skirts should have a place in every woman’s wardrobe because they are suitable for any situation and they never go out of fashion. 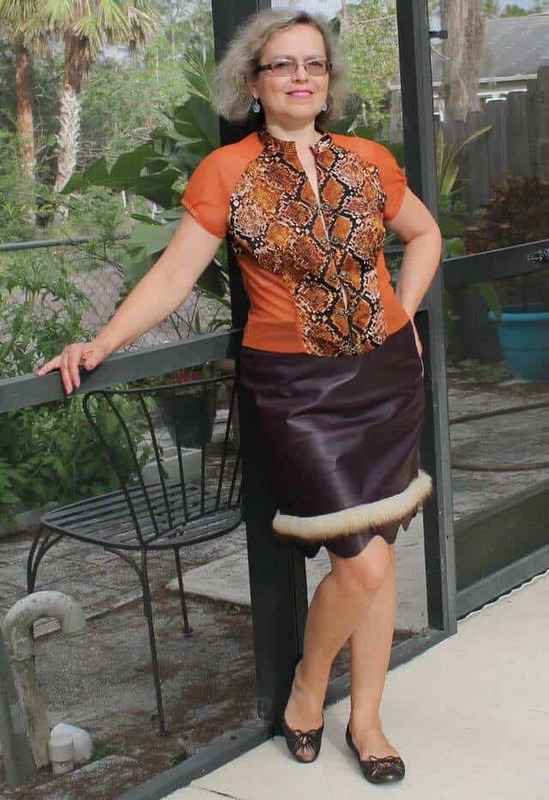 The pencil skirt can have varying types of cut, fabric, fit, length, and hemline. 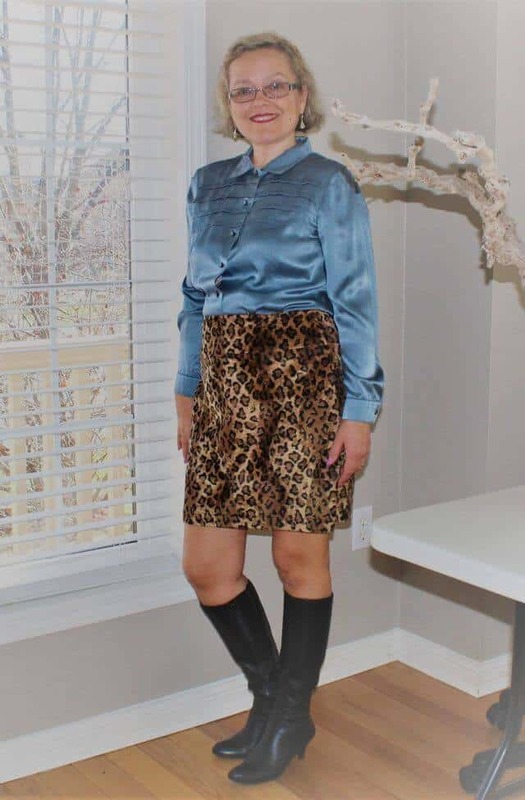 They say about this skirt: “Fits like a glove” and there is nothing to complain about. But is it even possible to have such a skirt? 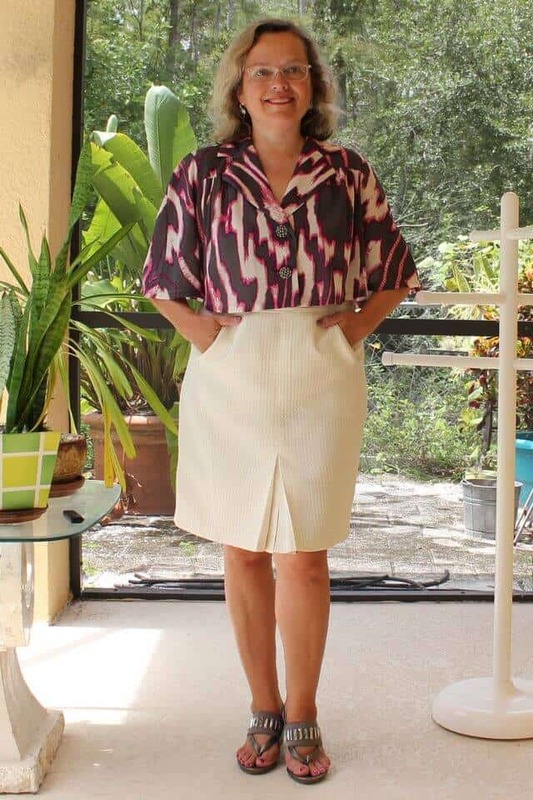 If you have a model figure (or pretty close to it) you may be lucky to buy a perfect pencil skirt or to make it yourself with a commercial pattern. But how many of us do have a perfect body? 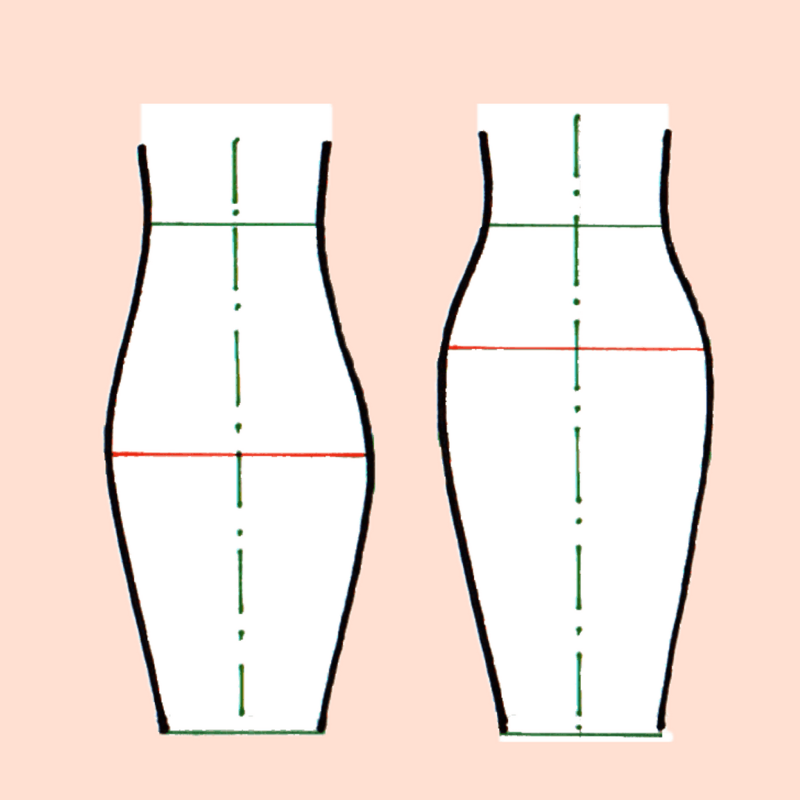 So here comes a problem: why a generic pencil skirt pattern doesn’t fit most of us? Let’s say that all these bodies have the same waist and hip circumstances. 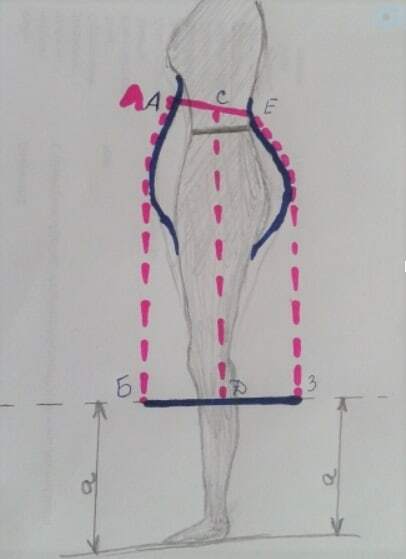 So, if we draft a pencil skirt pattern using the same measurements – the pattern will be the same for all of them because it can’t take all of those unique features into account … but the skirt will look differently on each of them. Also, many of us have large tummies, or protruding buttocks, or steep hips, or the general slope of the figure forward, etc. 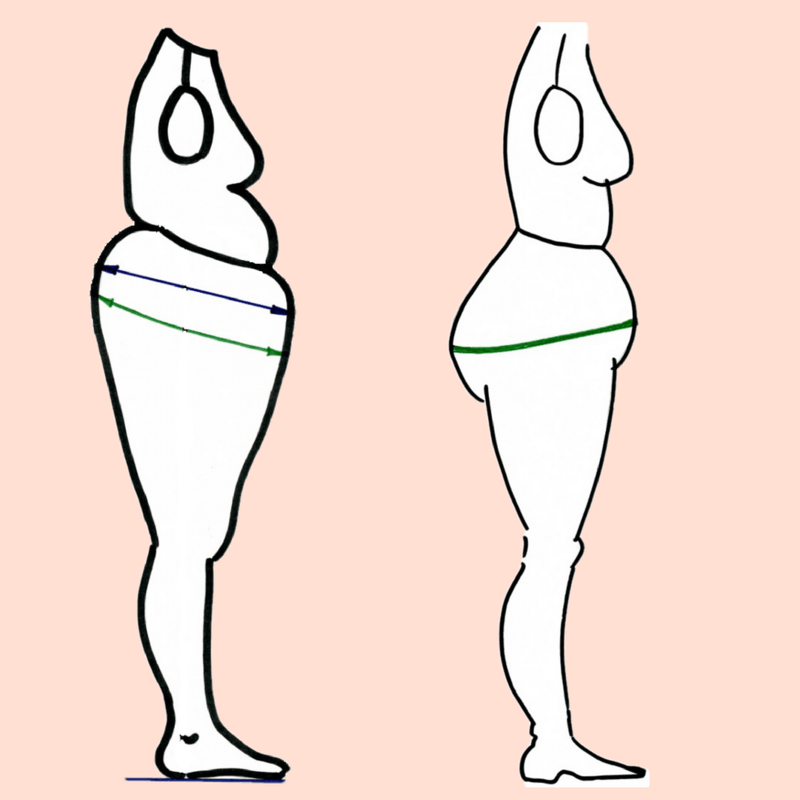 The position of the waistline can be different for different women. We used to think that the waistline is parallel to the floor. It’s not always true: sometimes it’s not parallel to the floor. And if we don’t take it into consideration while making our pencil skirt sloper we may end up with a skirt that fits like this. The hemline should be parallel to the floor, not the waistline. Here you can see a side view of an almost “model” figure (I wonder why do they call it standard or average?) 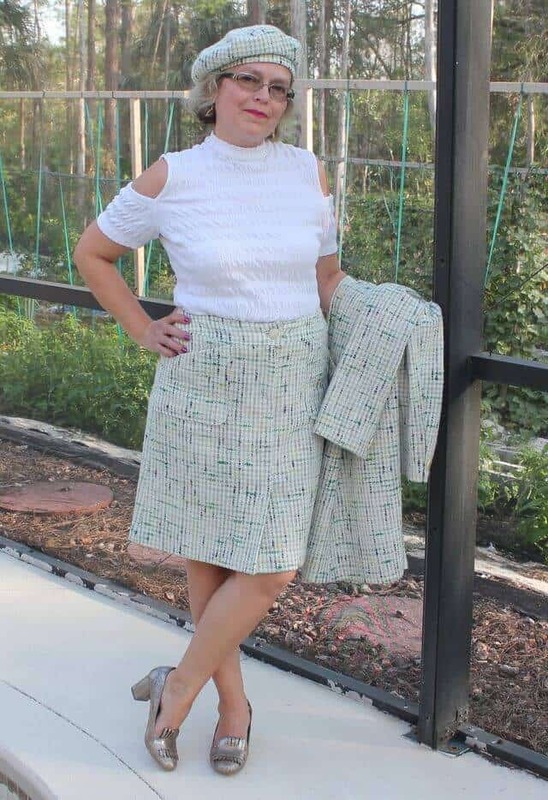 for which we can buy a pencil skirt easily and a pretty regular figure ( I would call it average) for which we want to make a pencil skirt pattern. 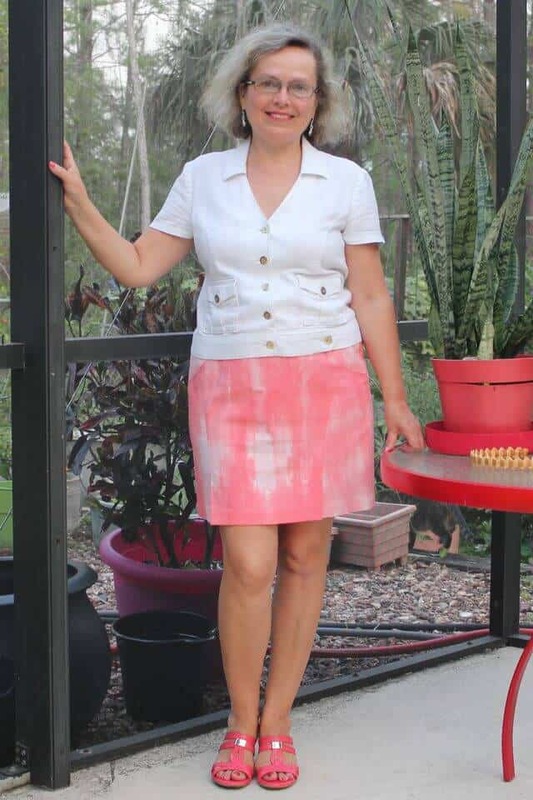 The question is – is it even possible to make a pencil skirt that will look good on the second figure, that will have a flattering fit for that woman? I think it’s very possible. We all can look beautiful with proper-made clothes. Look at the images below. All of them are showing a plus size woman wearing flattering and well-fitting pencil skirts. So, let’s see now how to take measurements for making a pencil skirt sloper. We don’t need to take many. 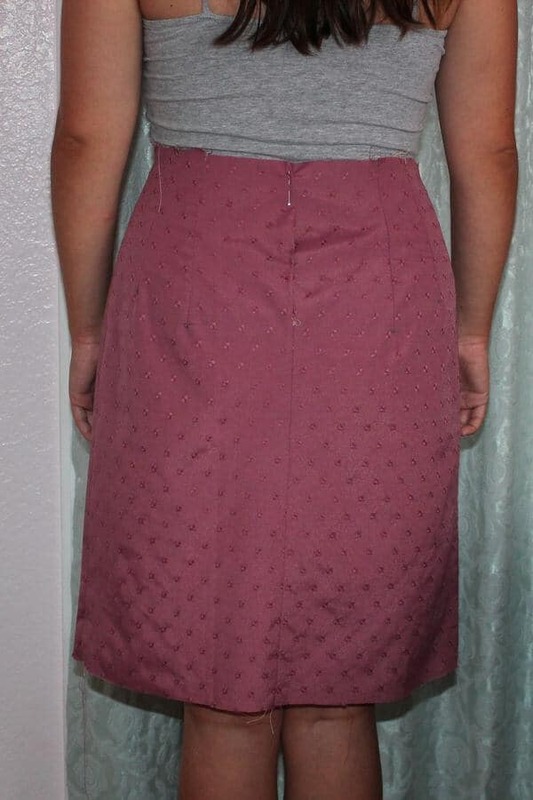 You can take your own measurements for the skirt or ask somebody to help you. Don’t wear shirts, blouses, dresses, pants, skirts, etc. It’s better to have only underwear for getting accurate numbers. Tie an elastic around your waist in the place where it’s convenient for you. Usually it’s the narrowest part of your belly. Try to accurately determine your natural waistline. It may go horizontally parallel to the floor but even on a slender figure, it’s not always true. A very useful hint: a skirt will always crawl up to your natural waist so it is important to find your natural waist line. I can say that this is the most difficult measurement. Why? Because any woman when taking this measurement draws in her belly! So try to stand upright and relaxed but don’t lie to yourself: take your real waistline if you want to breathe, eat, bend over and sit down in your skirt. 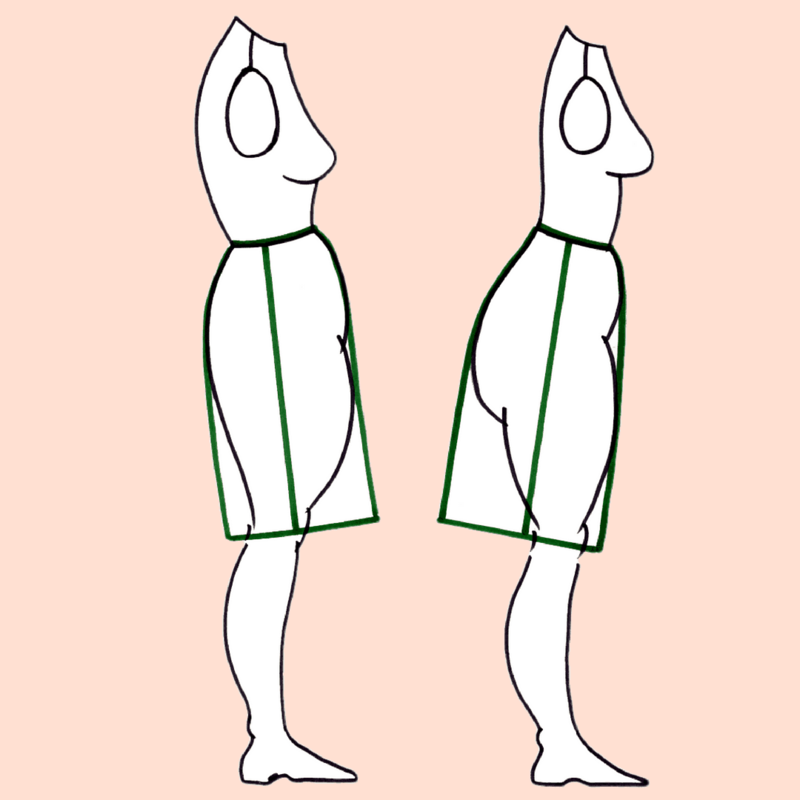 If you used to wear skirts (and pants) below your natural waist, take your waist measurement anyway as described above. This is necessary for a correct sloper and you can redesign your skirt waistline later. Usually it’s recommended to measure horizontally the widest part of your hips. But again it’s quite rare that the widest part of our bottoms goes parallel to the floor. Your stomach can protrude in different place than your buttocks. So we can measure like this in the drawings below. But there is another method, more accurate. Take a rectangular piece of rigid enough paper and wrap it over your bottom. Connect the edges with a scotch tape and make sure they go exactly vertical and parallel to each other. And after that take a measuring tape and measure your hips. Measure the vertical distance between your waist ( where we have an elastic, remember?) and the hips. Measure the desired length of the skirt. If you have a model body with long legs, then you can make a mini pencil skirt. But for a regular body, the best length is midi – just a little below the knee. Longer pencil skirts generally require high heels. Very important note: if your waistline is not parallel to the floor your skirt length will be different in the front and in the back. Look at the drawing below which I borrowed from another site, it shows very well the difference. You have to remember that we placed an elastic around the waist which indicates the place of the REAL position of the belt of the future skirt. Now you need to measure the distance from the elastic to the floor from points A, C, E, ie, on the stomach, along the side seams and your back. Then, take away from these measurements the distance from the floor to the desired hem edge of the skirt (in the drawing this distance is a). And now you will have your measurements for the length of your skirt in the front, in the back and at the side. Now you can draft your own sloper as recommended in this tutorial, for example. 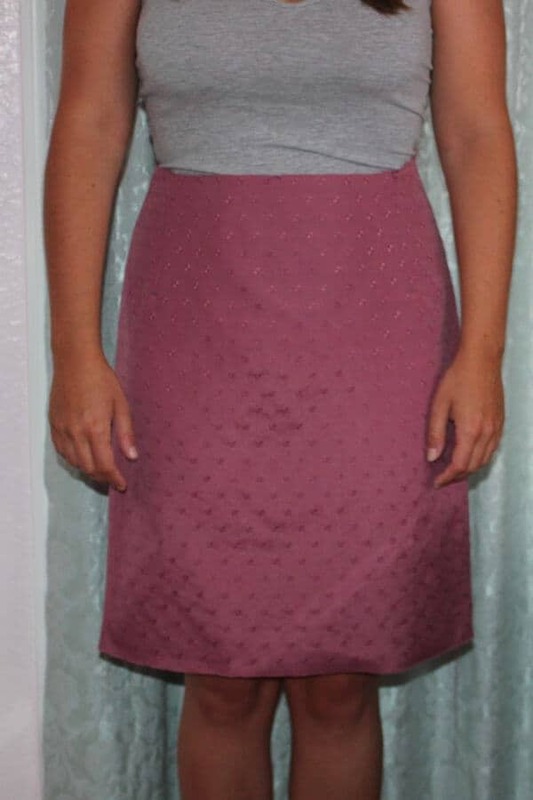 But I would like to show you how I make a well-fitting simple pencil skirt sloper. I am using the draping method. You can’t do it on your own body and you will need somebody to assist you. It took me only 15 minutes to make a sloper but I wasn’t really very careful and precise because my daughter was in a hurry and I just wanted to make a point and demonstrate the method. 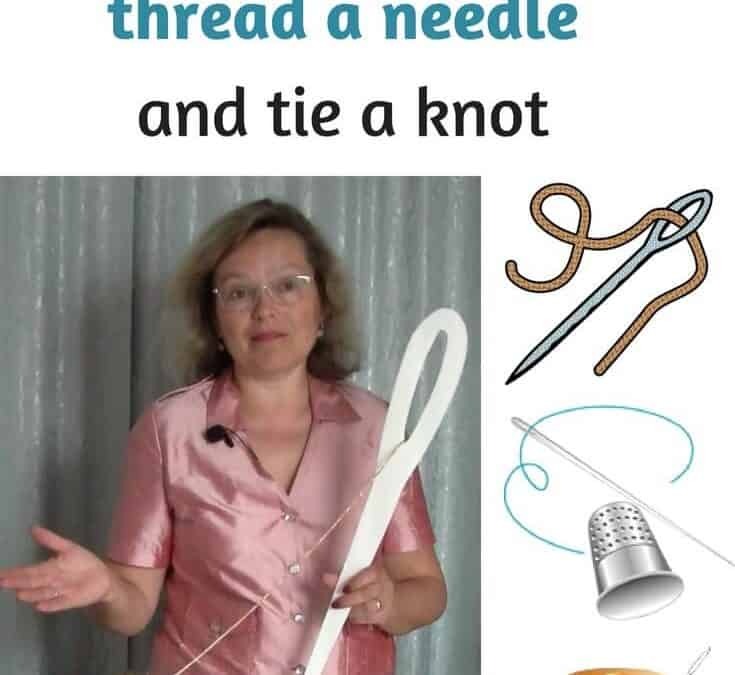 It only seems that it’s so simple, but if you don’t have enough sewing experience yet, it is better to do every step slowly checking twice if you are doing it right. So take your time and don’t be in a hurry, then your results will be better. It’s lightweight but strong and firm non-fusible, nonwoven interfacing that is designed for use in pattern drafting and tracing. 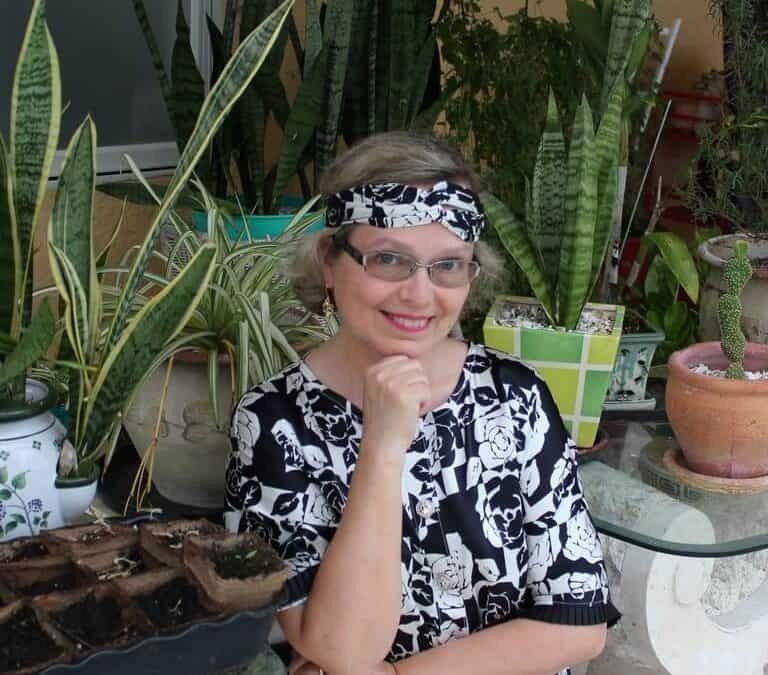 It is perfect for altering, duplicating, and tracing patterns. It is also inkjet printer safe, making it ideal for printing pattern pieces for extended use. It also doesn’t stretch which is important for making the pattern. I also have used this as a muslin for checking the fit. For drawing, I used just a regular pen and a marker. We need to draw 2 rectangles on that material. They will be our pattern framework. One rectangle is for the front of the skirt and another one is for the back of the skirt. But before that, we will have to calculate the proper size for them. How to do it? Very easy. Divide your hip measurement in half and add 1 inch to this number. Here I have to say why we need to add 1 inch though. This is for wearing ease because the finished skirt has to be a little larger than your actual measurements for comfortable wearing. There always should be a small gap between the body and the fabric, otherwise, the skirt will be too tight. I will use my daughter as a model for making the pencil skirt pattern. Her hip measurement is 39 inches. So the first number will be 39/2 + 1 = 20 ½ inches. But now comes some tricky moment. I don’t like my pencil skirt sloper to be equal at the front and the back. I always make the front a little bit bigger. So for the front, I add ½ inch and from the back, I subtract ½ inch. 20 ½ – ½ = 20 in for the back. Now we have to add seam allowances to these numbers. I want my seam allowances to be 1 inch. So I add 1 inch on each side of the rectangles. For my skirt, the numbers will be 22 inches for the back and 23 inches for the front. 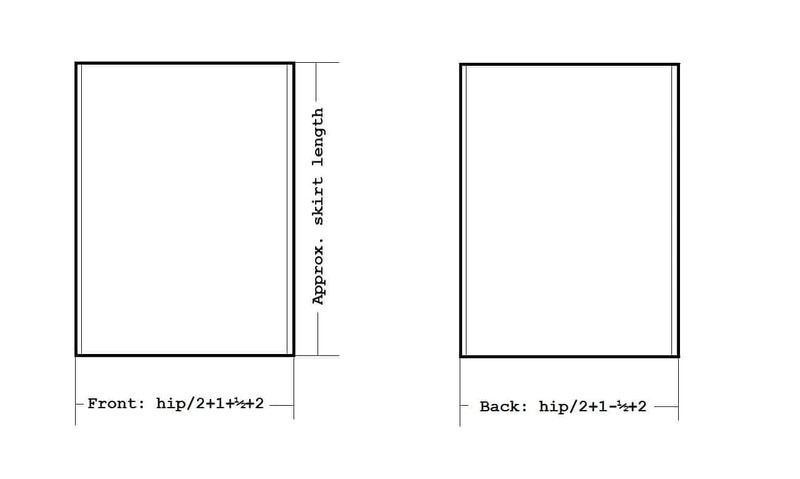 And the length of these 2 rectangles should be approximate length of your skirt. I made mine 24 inches. Cut these rectangles from the pattern material. Make sure you cut straight, keeping four 90 degrees angles. Draw visible lines for the center front and center back. To avoid confusion, mark all necessary lines with a marker. Pin these rectangles together at the sides. These will be our side seams. Leave some distance to put it on the model. I used my daughter as a model to demonstrate this method. Check the video below. You can find the complete description of the process under the video. I tied an elastic around her waist so we can see clearly where her natural waistline is. Make sure the center back line is aligning with the spine and the center front line is aligning with the belly button which is exactly in the middle. Remember that the hemline should be always parallel to the floor. As you can see the skirt already fits the body at the hip line and below which shows our hips measurement was correct. But it’s gaping a lot around the waist and we will have to change it now. Let’s start with the side seams. I slice the excess off the side seams, take in 1 inch on each side and make a new side seam line. It’s very important to keep this line exactly vertical – otherwise, the balance of the skirt will be compromised. The next very important step is to place darts. You can actually place them along the waistline wherever you like or consider appropriate. On my model, we can see that the difference between her waist and the hips is quite significant in the back. So I make two darts on each side of the skirt back. But your body will be different (each of us is unique) so consider this: if you will have to take up of more than ¾ inch divide it into two narrower darts. If it’s less than ¾ inch make just one dart on each side of the skirt back. I try to make the darts closer to the side seams and not closer to the center back. It seems to me this way the skirt fit will be better. Also, usually I see that they advise making dart’s centerline go exactly perpendicular to the waistline. Well, I place the darts with a slight angle so the darts’ points go slightly toward the side seams – to me they fit better this way. The next step is to make the front darts the same way. On my model, I see that in the front the darts will be much smaller in size. Don’t forget to keep the center line of the skirt in the proper place. Mark all the darts and side seams with a marker. I see the model body is symmetrical so I need to make everything perfect only on one side. I am not going to check the other side again because I will use only half of this template for making my sloper. 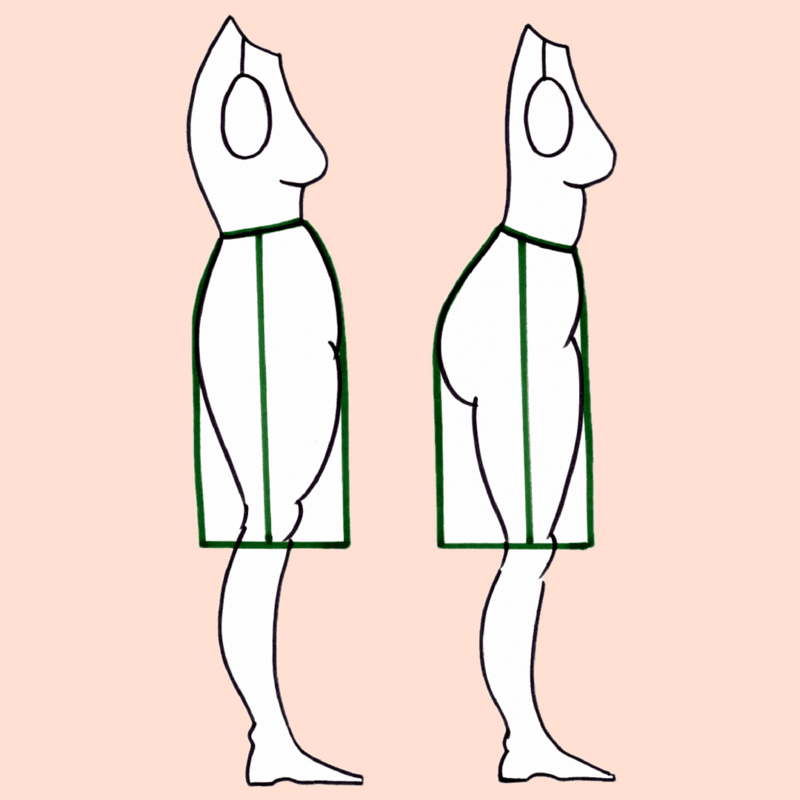 If you see that your body is not symmetrical (which is actually happening quite often) then you can work on both sides and try to make the perfect fit on both sides. Now I will have to draw a waistline for the skirt. I can see the elastic around her waist through the tracing material so I will draw the waistline exactly like this. Again, make sure the skirt hemline didn’t move and is parallel to the floor and side seams are exactly vertical. As I said before, I was a little bit in a hurry doing this pattern. But I advise you to be more accurate and patient with this material manipulation and further refine darts, their length and angles. It seems so simple to create a pattern like this. Well, it IS simple if you know what you are doing, when I did it myself the first time it did not seem that simple! I tried to explain all the necessary points and if you follow my instruction you should succeed. But it’s really easy to make a mistake. Now you will have to transfer the skirt template to the table and draw all necessary lines using a ruler. Here it’s really important to check for all darts if both sides are equal and if they have a slight difference you have to change that and make them both equal. Make a smooth curved line where we marked the waistline. Also, for a pencil skirt, we may need to taper the side seams. Don’t taper too much, ½ – 1 inch on each side seam at the hem level is usually enough. A larger amount can make it difficult to walk in the skirt. 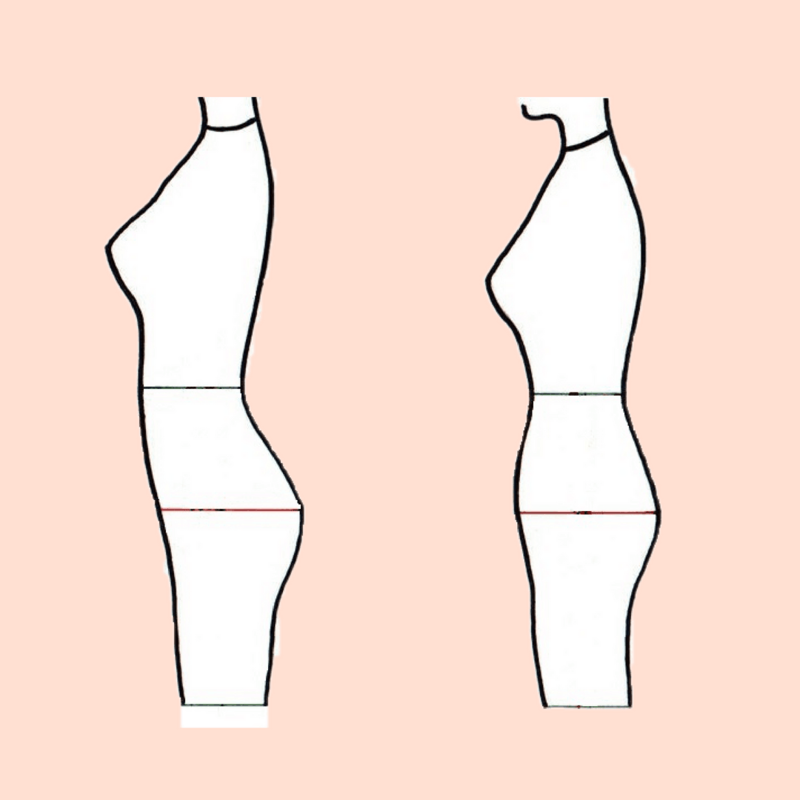 Slight tapering at the hem works with the natural curves of the body and makes curvy hips look more proportional. Try to experiment and find out what works the best for you and gives the most flattering look. Make your seam allowances – the regular number is ⅝ inch. Ok, you have created a simple pencil skirt sloper exactly to your body curves. Now you will have to check the fit and make a test skirt to tweak the fit. 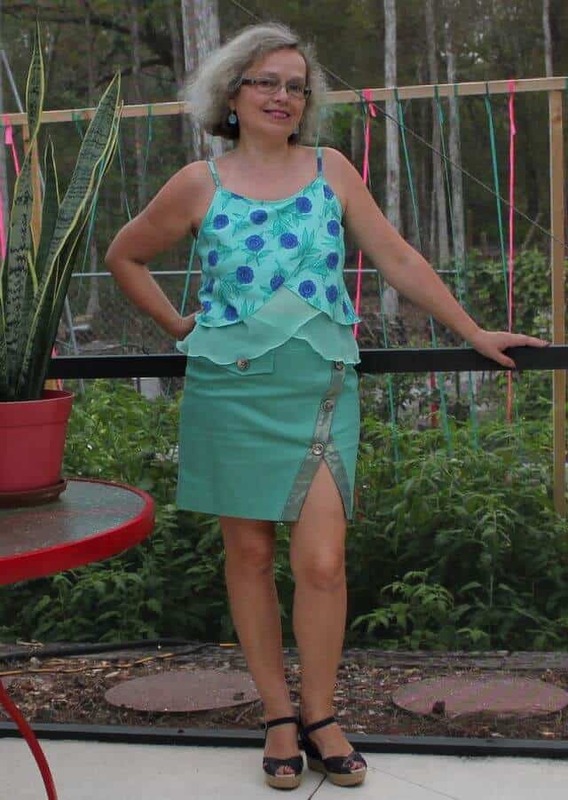 I made mine and I can see that even if I was in a hurry to make the pattern the skirt fits really well. Maybe I will need to change the waistline in the back though. I guess we all are used to wear jeans that are higher in the back. 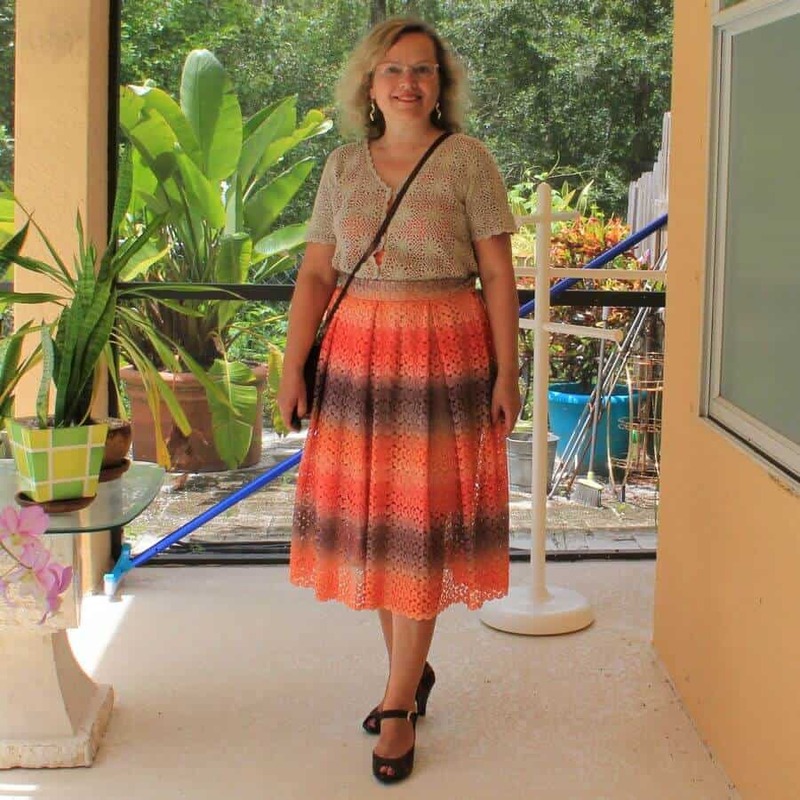 I made a pencil skirt sloper for myself many years ago and I am always using it as a base to draft different style skirts. Below you can see some skirts I made in the last years using my sloper. If you prefer a video tutorial on this check out my YouTube video here https://youtu.be/keTm5yuoDCQ. Did you like this guide? 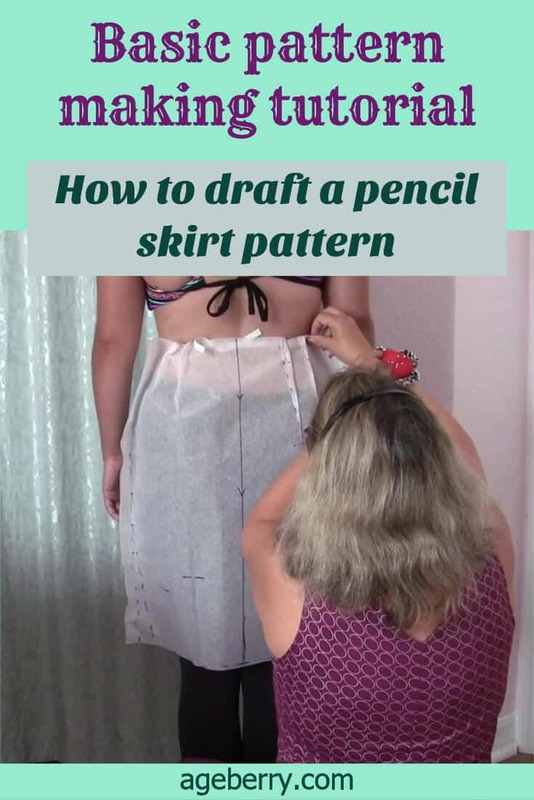 If you want to save it for future reference and to use it later when you are ready to sew the skirt, pin the image below or the first image of this article to your sewing board on Pinterest and follow me on Pinterest for more tips, tutorials, and inspiration. 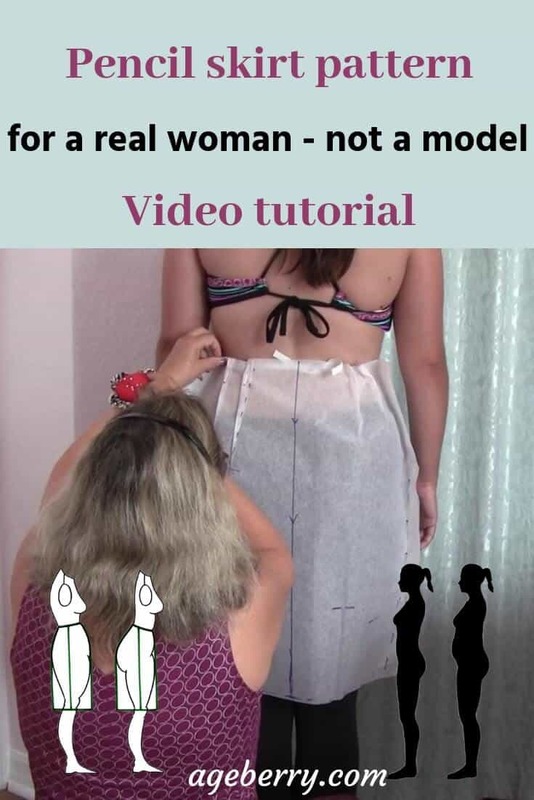 I have just found this tutorial many thanks it explains a lot !Just returning to dress making after many many years thank you! Thank you for your kind words! I am glad to know that my tutorial was helpful. I also find your site. I thank i will lern much. My englisch is not so good. Sorry. I am from the Netherlands. Thank you! Do you like sewing?